During Paschaltide, and hopefully all year long as well, we focus on what it means for our community to live into the reality of the resurrection of Jesus. The theme of the verses this week is that life is full of grace from God that flows through humans toward each other. The passage from Acts 4 is a succinct four verses. It acts as an introduction to the larger story in the next chapter of how God is going to deal with the sin of religious hypocrisy, deceit and ostentatious giving in the church age. For this week, however, we have a beautiful picture of unity and generosity in the church. All the people were of one heart and mind (v. 32), and those who had been sent out testified with power to the resurrection of Jesus (v. 33). What really interests me is the causal statement that comes next: God’s grace was so powerfully at work in the community that there were no needy among them. Those who owned valuable property didn’t consider it their own but sold it and placed all of it at the feet of the disciples (v. 32). In turn, the disciples distributed the wealth so that no one would be poor. Something about God’s grace working in people led directly to wealth redistribution. To be clear, the text doesn’t say that there weren’t rich people among them but that there were no poor. This isn’t complete economic equality. It is, however, recognizing full humanity of the poor and that involuntary poverty is degrading to the human person. The experience of receiving grace from God led immediately, automatically and repeatedly to those who had extra liquidating their property to remove poverty from their community. Joseph “Barnabas” was one of the generous grace-recipients who would later go on to be a companion of Saul/Paul during his missionary journeys around the eastern Mediterranean. The Gospel lesson includes a similar story of a recipient of God’s grace who then poured out his life for his companions. 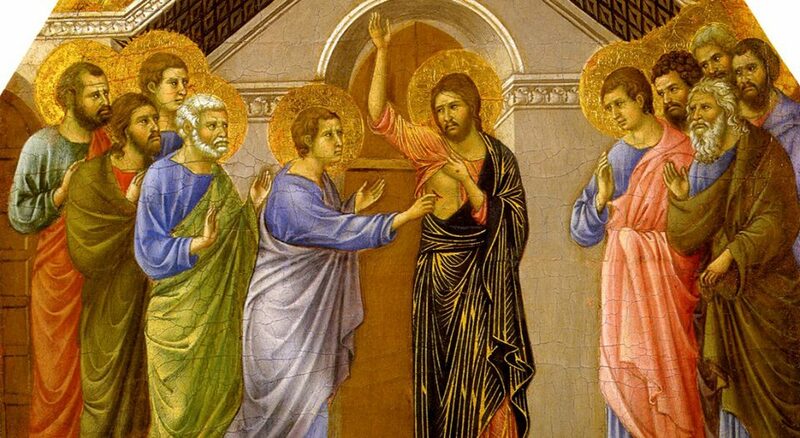 We often think of the disciple and apostle Thomas as only “doubting Thomas.” This is a great tragedy, I think. He was so committed to Jesus that he urged his fellows to follow Jesus knowingly to their deaths (John 11:16). After Thomas came to believe in the resurrection, his missionary zeal in his journeys to India and the Parthian Empire was so engaging that his spiritual descendants arguably outnumbered those of Peter and Paul combined until the disastrous Mongol raids of the 13th and 14th centuries decimated central and south Asian Christianity. Even today, there are hundreds of thousands, if not millions, of Christians across Asia who explicitly trace their faith to the missionary efforts of Thomas. For these reasons, it troubles me that we often frame Thomas by his one un-shining moment in Scripture. But Thomas did doubt, briefly. He firmly stated that unless he touched the resurrected Jesus’ wounds, he wouldn’t believe. This isn’t a higher standard than the other disciples, however. While they were hiding behind locked doors (and presumably Thomas wasn’t hiding with them), Jesus appeared to them and showed them his wounds in order that they recognize him (John 20:20). When the other disciples told Thomas what they’d experienced, Thomas only wanted to see what the rest of them had seen. Jesus then graciously appeared to Thomas and gave him the opportunity to see the risen Lord that his companions had seen a week earlier (v. 26). Jesus ordered Thomas to stop doubting and believe—and he did, instantly, exclaiming, “My Lord and my God!” Then Jesus said that Thomas had believed because he’d seen and blessed are those who will believe without seeing. This is the important bit: Thomas immediately set to work proving Jesus right. He set out to spread the blessing of knowing the resurrected Jesus to thousands of people who didn’t have the chance to see him in the flesh. Thomas’ response to God’s grace to him through the resurrected Jesus was to take what he’d been given (direct experience of the resurrected Lord) and share it with people. Whether property or a gift of an experience of Jesus, what we have isn’t to be considered our own. The experience of God’s grace demands that we live out the good news in our lives in a way to eradicate poverty—financial or spiritual—from among our community. I invite you to consider how you can be like Thomas and the early Christian community to not consider what you have been given as your own but rather a resource to lay down at the feet of the community as a response to, and conduit of, God’s grace.